Comes with a custom implementation for the submission info including Date, User, Picture and Comments. Social Style comes with a multitude of pre-configured, responsive column layouts [one-third] [two-thirds] [one-fourth] [three-fourths] [one-half] so you can create pages tailored to your needs. Create great showcases with examples of your work, your clients or your success stories using any of the two-, three- or four-column layouts, which are supported out of the box. 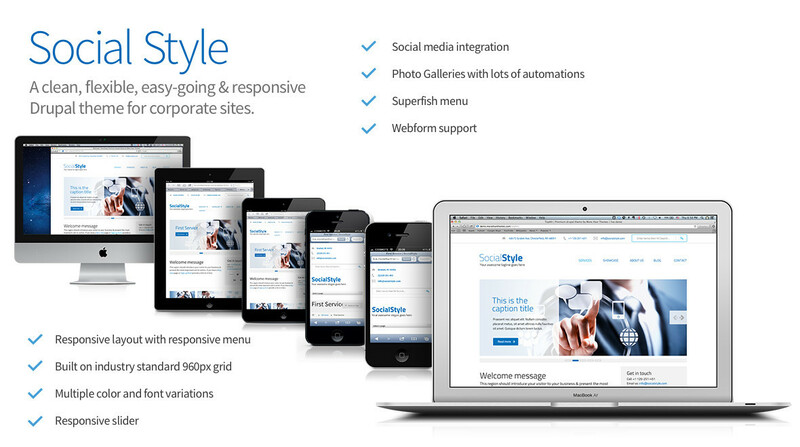 Social Style integrates with the Superfish module supporting gorgeous multi-level drop-down menus with smooth motion. Included is the relocating of sub-menus & hyperlink menu descriptions when they’d appear outside the browser window area. Leave your slideshow on the front page or set it to be displayed everywhere in your site. Slideshow configuration is available via the theme settings. Social Style comes equipped with a plugin which transforms the Main menu of your site into a dropdown select list when viewed from a mobile device. And you can configure the behavior of this plugin through the theme settings. Select among different font-schemes, with font-families for all tastes and corporate identities. Just pick the one that fits you with a couple of clicks from the theme settings. Leave the Sidebar First region without any blocks and the Content region will occupy all the available width. And it will still look not just good but great. It’s been designed and tested for this. Social Style integrates with the Webform module and supports gorgeous forms anywhere you want them. Enjoy the already implemented and custom-styled Webform Contact block.